An important game for both teams. Barcelona need to get back on track after some recent poor form, while Tottenham lost their first group match against Internazionale. Mauricio Pochettino opted for a 4-2-3-1 formation, whereas Ernesto Valverde set up his team in a 4-4-2/4-3-3, with Philippe Coutinho pushing up high on the left and Lionel Messi generally on the right half of the pitch in possession and the Brazilian dropping back alongside the rest of the midfielders while the Argentine stayed high up the pitch next to Luis Suarez when they didn’t have the ball. Barcelona scored just two minutes into the game with a goal that pretty much summed up Tottenham’s problems throughout it. Victor Wanyama is dragged up the pitch to press Arthur Melo, leaving space behind him for Sergio Busquets to receive the ball in. Harry Wink, who was marking Messi, must come across to close down Busquets, but he has enough time and space to do a full 360° turn before passing to the now free Messi. The Barcelona captain now has the space to pick out an inch perfect pass in behind for Jordi Alba, who lays it off for Coutinho to finish. This preference for pressing men rather than controlling space means large gaps can open up for the opposition to move into. It’s also often difficult for Tottenham players to block the passing lanes into those gaps when they have to focus on sticking close to their opposite number. Barcelona were extremely comfortable at passing around Tottenham’s press. Erik Lamela would stick very close to Busquets, but both Arthur and Ivan Rakitic were comfortbale dropping in alongside him to ensure the ball was able to be played out. This movement backwards would drag Winks or Wanyama high up the pitch, opening up space in front of the defence for Barcelona’s forwards. Messi obviously benefited most, but Coutinho would often come inside and Suarez would drop off, with only Toby Alderweireld out of the backline comfortable following them. Busquets also found that if he pushed up high enough his marker wouldn’t follow, leaving him a free man in midfield. As the half went on, Lucas Moura and Son Heung-min would start to come inside so that Wanyama and Winks didn’t have to push forward, but that only left Alba and Nelson Semedo free to push forward on the wings. Tottenham were left chasing shadows. Most crucially, Messi was constantly able to get on the ball. The second goal was a freakishly good volley from Rakitic but the attack again originated with Messi drifting into space and playing a perfect through ball. If Spurs were to get anything from the game, they had to limit probably the best player in history receiving the ball, yet Messi was time and again left free as a bird. Although it created many of their problems, the man-orientated pressing did also create Tottenham’s best attacks. It meant they vacated space in key areas, yet keeping so close to the opposition players did allow Spurs to frequently pounce on Barcelona passes high up in their half and immediately spring forward at the backline. Barcelona often looked slow to recover upon losing the ball, with Busquets in particular seeming either leggy or lazy, barely tracking back as the Spurs attackers poured forward. Outside of this pressing Spurs struggled to create though. Without Mousa Dembele or Christian Eriksen, only Winks was able to link play, giving them little way to break down Barcelona’s two banks of four. Part way through the first half, the frontline was rearranged with Lamela moving out to the left wing, Harry Kane dropping in at number ten and Son leading the line, presumably with the aim of having Kane help with creativity in the middle, but it had little effect and they returned to the original set-up for the second half. Spurs pulled one back early on in the second half. It’s difficult to judge because most of the build-up occured while a replay of a Barcelona attack was being shown, however it appears to just be a very good counter-attack. 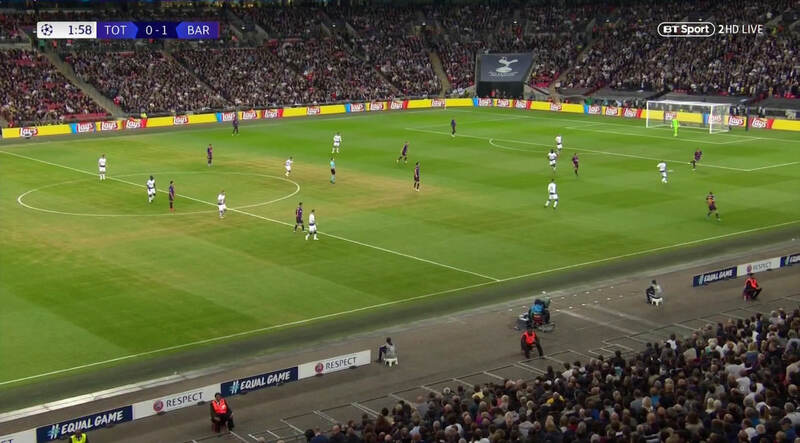 Spurs quickly play out to Lamela who with great touches plays a one-two with Moura, he dribbles purposefully through the middle, with Son’s movement opening up space for him to set up Kane, who wrong foots Semedo to finish. Barcelona got men back, but Tottenham seemed to just take their opportunity perfectly. Minutes later, Messi seemed to kill of Tottenham’s momentum. Fingers could be pointed at Son for failing to cut out Messi’s initial through ball or at Wanyama for not being in a position to cut out the return ball, but truthfully this goal was just Messi’s technical perfection. It does raise questions though: if Spurs had done more to frustrate Messi throughout the match, would he have been able to pull this off? The answer is still yes, because it’s Messi, but if this was his first few touches on the ball or his first shot it certainly becomes less likely that he would have the sharpness to pull it off so easily. Ten minutes later though, the Spurs comeback was on again. This goal shows the benefits of Tottenham’s man-orientated pressing perfectly: using a more zonal system, Kane is probably further way from Clement Lenglet and Alba’s misplaced pass is dangerous but not quite so disastrous – Lenglet probably has more time to recover. 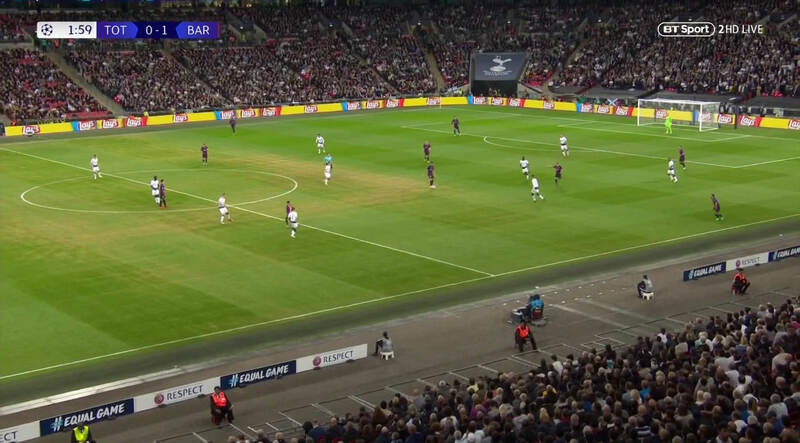 With Kane right on top of him though, Lenglet loses the ball and Barcelona are quite fortunate that Spurs’ attack breaks down. Nevertheless, they still concede as Lamela isn’t closed down on the edge of the area, allowing him to shoot. Spurs defended more compactly in the second half but still struggled to create and none of Pochettino’s changes really helped. Eric Dier for Wanyama was a like-for-like change, Son for Moussa Sissoko offered more energy but the Frenchman is awful on the ball, while Fernardo Llorente is less mobile than Lamela. As a result Spurs couldn’t complete their comeback and Messi wrapped up the win late on after Alba pounced on Sissoko trying to play the ball out. This wasn’t a great Barcelona performance, it was a great Messi performance, yet the way Tottenham set up played into their hands.